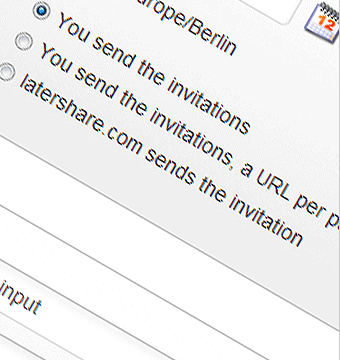 A latershare invitation can be sent personally by the initiator (by email, instant messaging, social messaging, etc.) or it can be sent automatically from latershare.com. For securing that each participant only posts for him or herself, individual links, one per participant, can be created. The initiator receives an admin link, through which he or she can modify or delete the latershare at any time. He or she can invite additional participants, send reminders to participants, look at the activity log or subscribe to this by RSS.